Are you looking for smoother, firmer and younger-looking skin? The Institute is excited to offer the Exilis Ultra face and neck procedure for skin tightening. This is the first non-invasive aesthetic device to simultaneously deliver ultrasound and radio frequency energy. This treatment is safe, comfortable, and effective. Dr. DeBias is exceptionally trained and experienced using RF (radio frequency) and ultrasound technologies for the purpose of helping patients achieve more youthful looking skin and optimized skin health. He and the professional staff at The Institute have successfully performed thousands of radio frequency skin tightening procedures to date using state-of-the-art protocols. Speak with Dr. DeBias today to find a treatment plan that will optimize your skin health and help you achieve your aesthetic skin care desires and needs. FEEL REJUVENATED ~ LOOK REFRESHED! 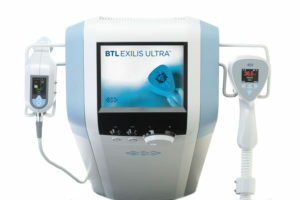 The Exilis Ultra device will be placed over the targeted treatment area. The handpiece delivers focused RF and ultrasound energy to the deep layers of the skin while keeping the surface soft and cool. The appropriate combination of heat and cooling makes this skin tightening treatment both effective and comfortable. What areas can Exilis Ultra treat? Exilis Ultra skin treatments help to firm skin in the face and neck. Exilis Ultra skin devices work by using ultrasound and radio frequency energy for facial tightening. The energy heats up the deep layers of the skin. This causes the fat cells to shrink and the body to regenerate new collagen. The result of Exilis Ultra is firmer and tighter skin. Over time, the skin begins to look healthier and younger. Treatments take about 10 minutes per session. There may be temporary redness for a few hours after your treatment. It is important to stay hydrated and increase water intake on the day before, the day of, and the day after your treatment. How many treatments for optimal results? Speak with Dr. DeBias to determine a treatment plan that will yield the best possible outcome and meet your expectations. It takes about 2-4 weeks to see results, with up to a 6 month transformation period. Venus Freeze and Pellevé are other no downtime, rf skin tightening treatments offered at The Institute. For patients looking for the most dramatic results (safe and natural), Active FXTM is the Gold Standard for laser skin resurfacing. Patients who are seeking more dramatic results but do not want to have a lot of downtime, Venus Viva and INFINI are two rf microneedling skin treatments that may interest you.